Enable you to split and combine in a few clicks. Split screen videos are trending and you can find them in wide range over streaming sites. Most of the time these videos are used by marketing experts to compare different products on same screen. But these days, people are also creating other adventurous video projects with this feature. If you are also interested to develop a split screen video where two videos can be played simultaneously on same screen as each one of these will share 50% portion then Adobe Premiere Pro can assist you better. This software platform possesses interactive tools for split screen feature. The article below contains step by step guidelines about tricks to create Split Screen videos. If you are new to the video editing world then steps described above in Premiere Pro section may appear little complicated to you. Most of the beginners wish to work on a system that is handy and can provide fast editing services. Here we recommend WonderShare Filmora for your split screen editing needs. It can get your job done within few seconds and the end preset results use to be awesome. You will be glad to know that Filmora supports more than 150 media file formats so users can process any video file here. Filmora provides several ready -to-go split-screen presets, so all you need to do is just preview the built-in split screen style and drag it to the timeline, and then add videos to the split-screen preset. Filmora further provides easy sharing abilities that mean users can directly update their edited videos to social media platforms or they can be saved to external storage devices for future access. It is good to start with the free version of Wondershare Filmora as it is also a feature rich tool and once you learn the basics then go for complete package that is affordable for beginners too. Note: we will take examples of this video to illustrate the position settings. First of all you have to import your both videos on Premiere Pro. Use drag and drop feature to get them from any folder located inside your computer and place one over top of another on timeline to create a new sequence. To make a split-screen effect video, it is important for both videos to share the same length. So you need to adjust their alignment to make sure that the videos have the same period. Note: If you don't need the video audio, please remember to remove it before go ahead. It is time to highlight your first clip in the timeline and then move towards Effects Controls Panel. Here you will find Motion option; adjust settings for the position of videos. In case if you simply need to get them spread in fifty-fifty portion then update the number 960 to 1920 in position category. Go to the preview window and check the changes you made recently. It will show you both the videos occupying 50-50 percent space on screen and screen is well split in the middle. But note that these settings will not display your video information correctly as most of the objects will be hidden due to the available 50% screen coverage. 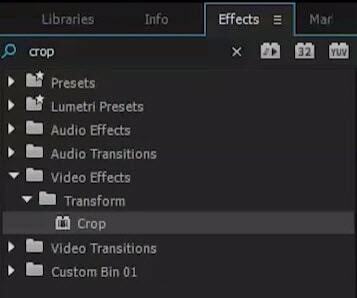 Now you have to move to the Effects panel and search for crop effect over there in the search bar. It will be under Transform in the Video Effects section. Simply drag this Crop option to the timeline window and place it on the top of first clip. Move to the settings of crop effect and then crop right and left side of video in such a manner that it can be fixed inside split screen. Use position slider to make desired adjustments and save results once get satisfied with its alignment. 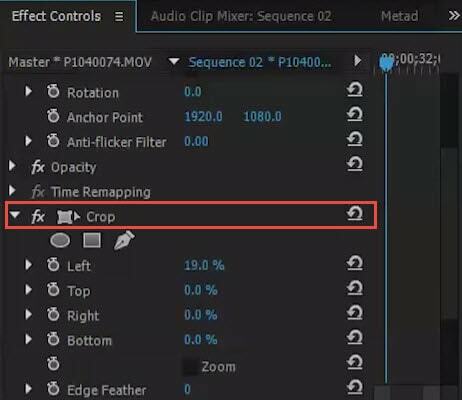 Click to check the detailed information about How to crop videos in Premiere Pro. Now follow the same step to adjust the position of the second video and apply crop settings to second video on screen. You can always check the result in the preview window and adjust the settings to get a better split-screen effect video. Also, you can create a black bar between this side-by-side video if you need. To apply a black bar, just move the video clips away from each other. You can also adjust the bar color or style of the split-screen effect in Premiere Pro. For the specific steps, you can check the video below from 2:56. As you have learnt the split screen effect now so it is possible to add more than two videos to single screen by splitting it into multiple sections. Premiere Pro assists users in fast adjustments of all settings. Once you are done with all these steps, your split screen video will be ready and now it can be shared on social media sites with ease. Adjust the audio information for all video clips and you will definitely get great response from viewers. 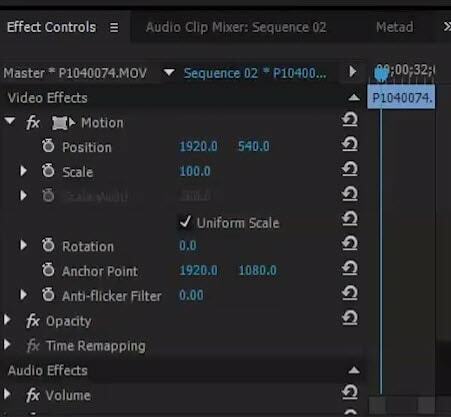 I hope the information above is useful for you to put videos side by side and make a split-screen effect in Premiere Pro. With the split-screen effect, you can empower your imagination with more creativities. If you are looking for an alternative to Premiere Pro to make split-screen video in a much easier way, don’t forget give Filmora a try.